Snails are not only beautiful at the restaurant! Snails are popular at the restaurant but they are overlooked as a photo subject. Close to my home i have a Park where there is a lot of them and easy to find and photograph . 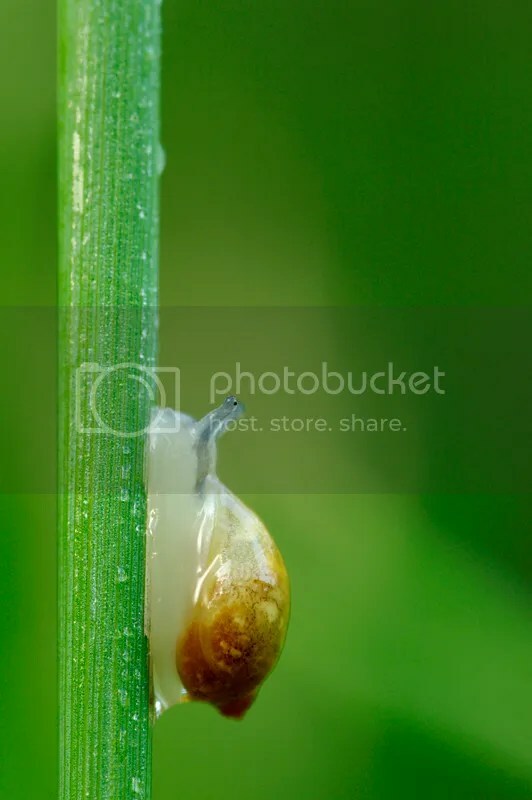 I prefer misty morning or rainy days because on hot sunny days the snails just stay in their shells, they like humid days or habitat. You will need a tripod but also something that you can use to stabilize your camera at ground level (beanbag, or a ziploc filled with sand), my camera have Shake Reduction (SR) and it’s very helpful for this kind of photography. Now with my K-01 it’s easier to shoot at ground level since i don’t need to look in the viewfinder like my K20D, the live view and focus peaking work very well to compose and focus the shot. A camera with a tilting or swivel LCD would be even easier to use, but the K-01 is still quite easy to use at ground level. You will need a relatively fast shutter speed….. yes i’m serious …. those snails are always on the move and the antenna (eyes) are nearly always moving. Having the eyes, head and shell in relatively the same plane of focus is not evident since they move their eyes in many directions very often. Flash can help to obtain better light and/or faster shutter speed, i prefer to use natural light. Most of my photos are done at/or near ground level but don’t forget to look in the trees because they are often hanging on the branches or leaves. Vary your point of view and habitat if possible, so not all your shots will look the same. 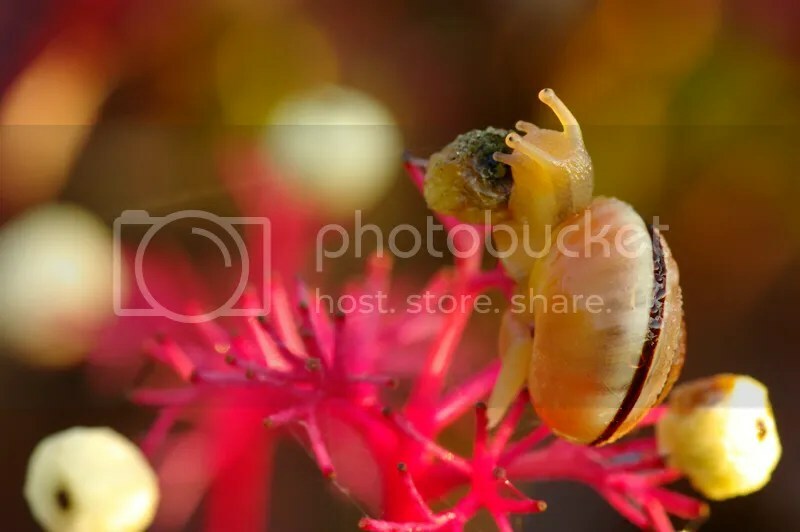 Snail at sunrise in autumn light. Surrounded by Stone crop flowers. 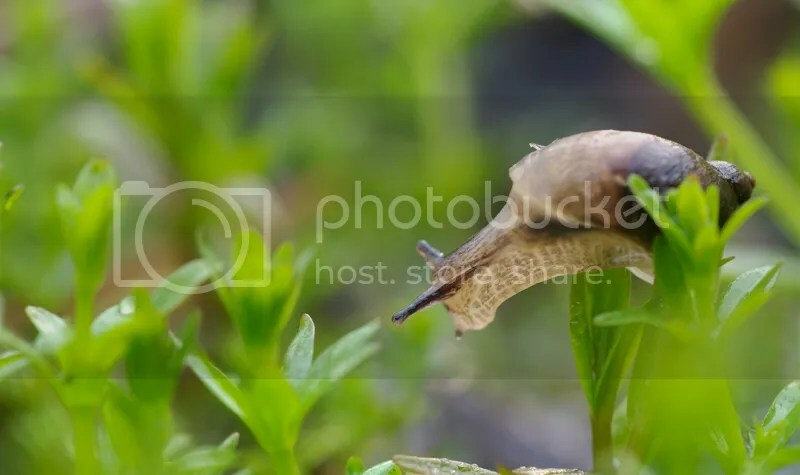 Young Snail on a weed. All 3 shots above taken with Pentax K20D, Pentax DFA100mm Macro WR, tripod. The most useful lens is a Macro lens, the majority of my snails photos are taken with my 100mm Macro because snails are quite small and to better control the background. If i can i will use my 35mm Macro and 14mm to show more of the habitat. 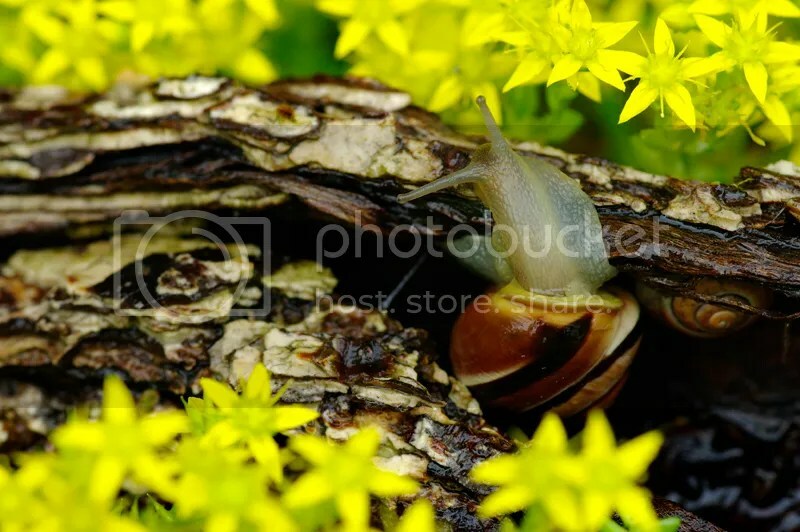 My Pentax DA14mm can focus quite close so i’m able to get the snails large enough in the frame and still have place to show it’s environment. You have to be careful with that 14mm since you will be shooting at it’s minimum focusing distance (17 cm) you can cast a shadow with the camera or your head on the subject. 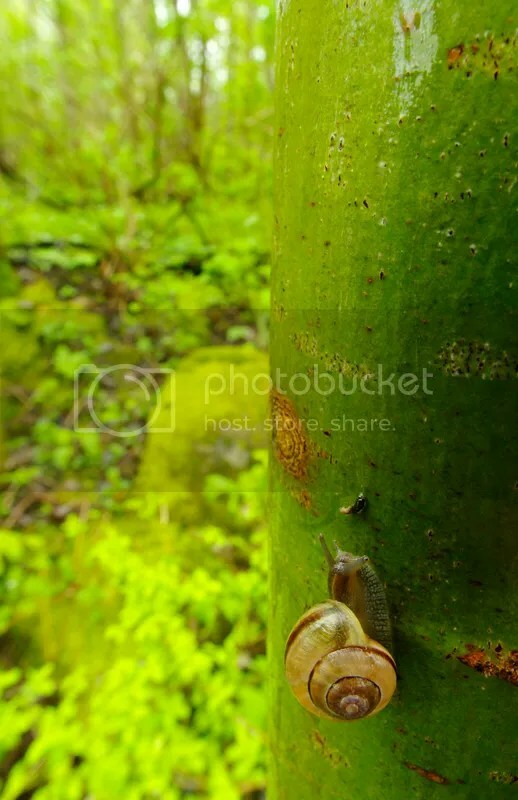 Snail on an Aspen tree after the rain. Pentax K20D, Pentax DA14mm, handheld with SR, ISO 800, 1/15 sec. at f/11. Pentax K-01, DFA 100mm Macro WR, ISO 1000, 1/80 sec. at f/6.3, handheld with SR. This entry was posted on April 23, 2012 by Steeve Marcoux. It was filed under Photo experience and was tagged with humid days, macro lens, misty morning, nature.